Can Alaska Air Reach $90? How is Alaska Airlines Shaping UP? What Will Drive Alaska Air’s Near Term Growth? How Did Alaska Perform In Q2? How Sensitive Is Alaska Air’s Price To Oil Prices? How Did Alaska Air Perform In Q1? How Did Alaska Air Perform Operationally In November? Is The Market Pricing Alaska Air Fairly? Alaska Air Group (NYSE:ALK) has had a pretty interesting year in 2017. Like its competitors, the company recorded a better first half than second half. This was primarily because operations took a heavy hit, as two major hurricanes pummelled over the East Coast and Caribbean. In addition, the air carrier recorded a considerable loss in earnings through the year on increased wages, continuing inclusion costs, and rising fuel prices. For the reasons stated above, Alaska’s stock price took quite a beating over the quarters. In fact, the stock price fell considerably from its all time high at the beginning of 2017, to just around $61. While a fall in valuation is justified, we believe that the market has unfairly punished the stock. According to our calculations, our price estimate for the stock comes in around $71. We have created an interactive dashboard analysis to estimate Alaska’s valuation based on its expected revenue for FY 2018. Click on the link to modify the figures to arrive at your own price estimate. In general, Alaska derives its revenues from four sources – Mainline, Regional, Freight, and Other. While Other revenues are expected to increase positively, we believe that Mainline, Regional, and Freight segments are going to be the primary revenue drivers. Overall, Mainline revenues are expected to grow on higher demand for air travel. With an improving economy, both business and leisure travel are expected to grow significantly in the year. That said, the company has warned that growth is expected to slow over the coming year. This is primarily because there is substantial competitive capacity in the market, which is expected to hurt unit revenues in the coming quarters. That said, the company has a plan to try to offset that headwind. For starters, the airline hopes to introduce a cheaper fare section, much like a “basic economy” seating in an attempt to increase revenue. This is bound to benefit the top line at Regional as well. 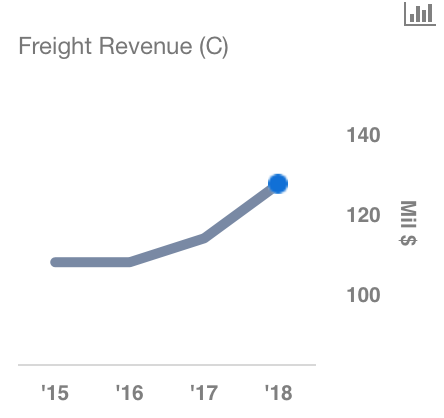 Revenues at Freight are expected to grow at almost 12% in the year, making it the fastest growing division in the company. This is primarily due to the inclusion of Virgin’s Freight business that has contributed heavily to the segment’s top line thus far. As one can see from the calculations above, it’s quite clear that Alaska’s stock price has much room to grow. We could see the stock price increase over the next few quarters.